Add class to any flat roof! Available in a Choice of White, Rosewood or Light Oak and supplied with either 25mm polycarbonate or an optional low e glass roof and sides. Self Cleaning, Blue Tint & Triple Glazing are available as optional upgrades. Comes with Cill & Gutter Pack as standard. 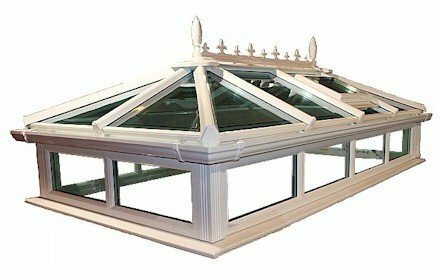 Our roof lanterns come complete with Low e toughened argon filled glass in the roof and sides as standard, or you can choose to upgrade the roof glass to Self Cleaning or Blue Tint Glass in either double or triple glazed. 70mm profile windows (optional opening windows) Guttering - Hunter Regency..
Our roof lanterns come complete with Low e toughened argon filled glass in the roof and sides as standard, or you can choose to upgrade the roof glass to Self Cleaning or Blue Tint Glass in either double or triple glazed. 70mm profile windows (optional opening windows) Guttering - Hunter Re..
Chain driven powered opener for roof and side windows Electrical Operated Vent Openers Slimline electric motor pre-fitted to vent for variable opening, supplied with surface mounted rocker switch. .. Description: Glass Cleaner is a powerful glass cleaning agent containing a high level of detergents and solvents for rapid drying to a smear and static free finish. May also be used on tiling, VDUs, TV screens, chrome etc.​ ..